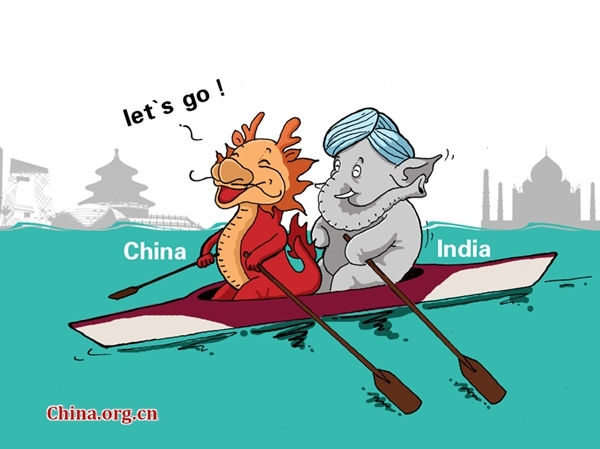 Decades ago, the Chinese leader Deng Xiaoping told the then visiting Indian Prime Minister Rajiv Gandhi: "An Asian Century is only possible when India and China come together." A great visionary as Deng was, he must have sensed the enormous potential of the two giant Asian neighbors that together accounted for more than half the world's wealth some three centuries ago. Spanning over 2000 years, two neighbors had mushrooming economic and cultural ties. The famous Silk Road not only served as the key trade route between India and China, but also facilitated the spread of Buddhism to East Asia. The two countries which jointly drafted "panchsheel" (five principles of non-alignment) and signed several treaties and exchanges in the 1950s turned enemies and strangers over an unfortunate border war in 1962. For several decades, India and China had very minimal exchanges at the political and diplomatic levels, let alone business and people to people contacts. Things began softening towards the late 1980s as the two large developing economies felt the need to move forward. Rajiv Gandhi's path-breaking visit to China in 1988 helped to normalize the relationship. China took a step further when it announced that the Sino-Indian relation was the "important bilateral relationship of the century." The net outcome was that 2013 saw the high profile visits of then Indian Prime Minister Manmohan Singh to Beijing and Chinese Premier Li Keqiang to Delhi in the same calendar year. However, the real momentum in the relationship came when Xi Jinping assumed the post of president and Narendra Modi took the mantle of premiership in India a year later. While President Xi took the early initiative and chose to break protocol to visit Modi's native city Ahmedabad, Prime Minister Narendra Modi paid a return trip to China by visiting Xi's native province of Shaanxi. These are unmistakable signs of a thaw in the India-China relationship. It is true the boundary issue remains an open question and the line has yet to be delineated, but this has not stopped the political leadership of two countries cooperating on a range of issues. For instance, trade relations are at an all time high, closing to US$100 billion. While hundreds of Chinese companies are making a beeline to invest in the Made in India project, Indian ITES behemoths such as TCS and Infosys are investing in China. The India-China relationship has taken a visible positive turn in recent years, with exchange of frequent visits by the top leadership, however there is a yawning gap at the civil society level.